Now, of course, if you are a regular reader of my website, you know that stock price declines are what you should get excited about because they represent great buying opportunities to own excellent companies that grow profits and dividends year after year. Coca-Cola and Johnson & Johnson have raised earnings per share in nine of the last ten years, and have raised dividends in each of those years (in fact, the dividend has gone up every year going back a half century). Why wouldn’t you get excited about Coca-Cola falling from $40 to $30 per share? If that happened, a $10,000 investment would buy you $373 in annual dividend income instead of $280 in annual income. If Johnson & Johnson fell from $85 per share to $70 per share, you would start getting $377 in annual dividend income instead of $310 in annual income. Which of those income bases would you rather have grow at 10%? When you are dealing with that subset of companies that are truly excellent, you can have the assurance that a lower price represents more value. If Colgate falls 50%, that’s a hell of a good time to buy more shares and those dividends can’t come soon enough to reinvest. Nevertheless, at some point over the long-term, the total returns you experience mimic the earnings per share growth rate of the firm (there are some exceptions such as when a company grows 8% for ten years and then experiences permanent impairment to its earnings potential thereafter, but this is a good rule of thumb that we can get some mileage out of). But as Benjamin Graham warned us, the stock market is a voting machine in the short run, but a weighing machine in the long run. We see that in the statistics I highlight above. The long-term trend of earnings per share for American businesses is up because large corporations retain earnings that they can use to pay down debt, buy back stock, or grow operations, and this allows us to have the reasonable certainty that Coca-Cola, Procter & Gamble, Johnson & Johnson, PepsiCo, and the rest of the usual suspects will be worth more ten years from now. But as that statistic shows, anything can happen in the short run. In a given day, you might as well flip a coin to guess whether the stock market will go up. And since it is driven by emotion, there is little someone with my skill set can do to guess which direction the market will be headed. But once we start thinking annually, we can see that three years out of four, we are going to be richer than we were the previous year. The longer the time period, the more likely we are to have business success with our holdings. Since 1926, there have been no twenty-year periods when the S&P 500 did not create wealth on an inflation-adjusted basis if you count reinvested dividends. This is why people say that long-term investing works. I am excited as hell to be an American. It has never been easier to establish ownership stakes in excellent companies (all you have to do is visit computershare.com, enter your personal information, and voila, you are buying shares of Exxon each month with no fees!) and I am blessed that I live in the country whose multinationals are taking over the world, which allows me the benefit of owning companies I understand and benefitting from the favorable tax structure that exists for companies domiciled in the United States. The only way dominant companies fall apart in the United States is due to technological change or financial blowups from taking on too much debt. That’s what happened to companies like Eastman Kodak and Wachovia. If you stick with excellent companies that have relatively modest debt loads, it is hard to screw up blue-chip investing. This 4th of July, while everyone else around you is BBQing, drinking alcohol, and shaking the firecrackers, take fifteen minutes out of your day to establish ownership in an excellent American blue-chip stock. The opportunities for wealth-building in this country are unparalleled when you review the scope of human history. 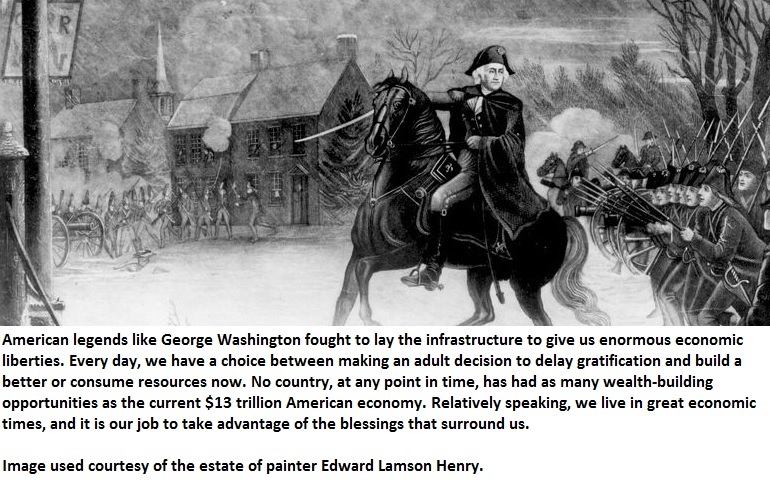 Our founding fathers could not imagine a world in which it is so easy to become an owner in an excellent business. Take advantage of those opportunities, and lay the groundwork that will reap fruits and blessings upon your future self.